Dimensions: 6.8 in. (W) x 10.8 in. (H) x 0.6 in. (D); Weight: 0.4 lbs. 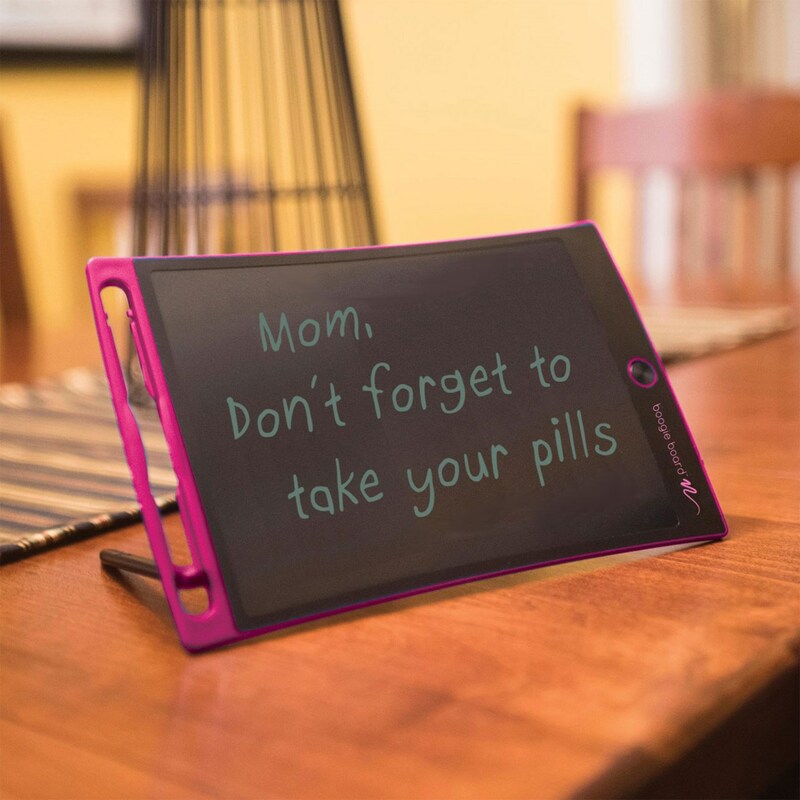 The Boogie Board Jot 8.5 LCD eWriter has a reusable, bright, high-contrast, writing surface to quickly jot down notes, messages, phone numbers, or lists. Easily take it to-go or place it in convenient locations around the home or office. 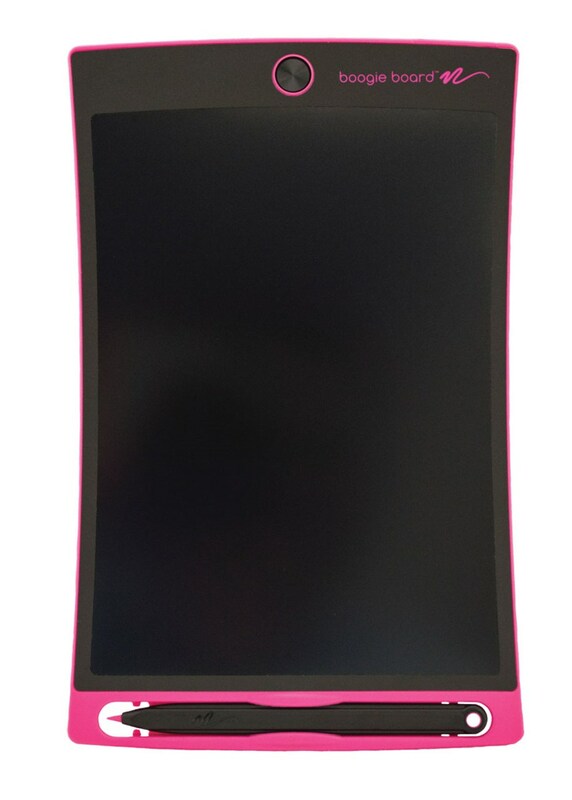 The Boogie Board Jot 8.5 LCD eWriter is the flagship Boogie Board product. In addition to offering the brightest LCD, it's the perfect size for notes, lists, reminders, personal messages, and more. Organizations representing people with certain impediments, such as ALS, vocal cord paralysis, stroke victims, etc. endorse them for a number of different purposes, including communicating, developing fine motor skills, and practicing memory exercises. The new, improved, high-contrast writing surface creates an almost luminescent line for writing notes, lists, and reminders. And because the Boogie Board Jot 8.5 does not require power to create or maintain an image, no on-off button is necessary. Pressing the erase button supplies a small amount of power to clear the image. The free-for-download Jot mobile app allows you to scan, edit, save, and share content that you've created with others. 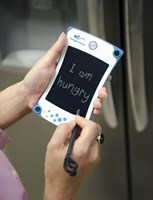 Boogie Board eWriters provide a natural, pen-on-paper, writing experience. They eliminate the need for paper, scratch pads, and sticky notes - you simply write and erase. The LCD writing screen is engineered to feel just like writing with pen on paper. The image stays as long as you need it to and can be easily erased with the touch of a button. Create and erase again and again, without the need to charge or connect. 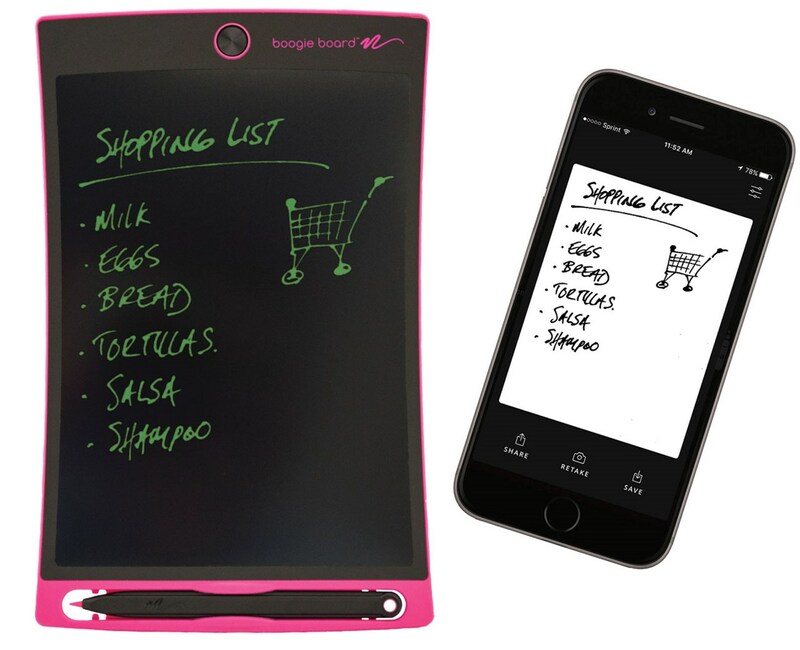 While The Boogie Board Jot 8.5 does not connect to a computer and cannot save images, you are able to save and edit what is written on the display through an app that is available for free on the App Store and Google Play. It does not save to the device itself. Download the free Jot mobile app which quickly captures writing or drawing created on your Boogie Board. Simply take a photo from the app and see your work converted into a clean black-on-white image to save and access anytime from your iOS or Android device. The new, high-contrast writing surface allows the Jot App to scan the surface, separate the writing from the background, and create a black-and-white file for you to edit, save and share. - To clean: Use a soft, lint-free microfiber cleaning cloth after gently brushing off the surface. If necessary, use a small amount of LCD cleaner. Do not spray the writing surface directly. Spray a small amount of cleaner onto a soft, lint-free cloth and apply moderate pressure in a circular motion starting in the center of the writing surface working to the edges. - The installed CR2016 3-volt coin-cell battery lasts up to 50,000 erases and is user-replaceable. - Do not apply extreme pressure or use any tool that could damage the writing surface. - Do not submerse Boogie Board in water. - Do not expose Boogie Board to prolonged sunlight.